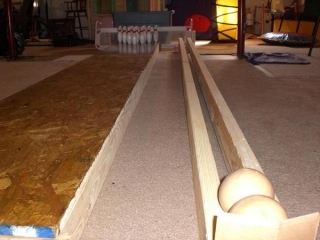 Since I didn’t have the room required for a regulation-sized lane (it’s nearly 78 feet from the start of the approach to the end of the lane on a regulation lane) I started working with scaling the lane down to a size that I could put in my basement. 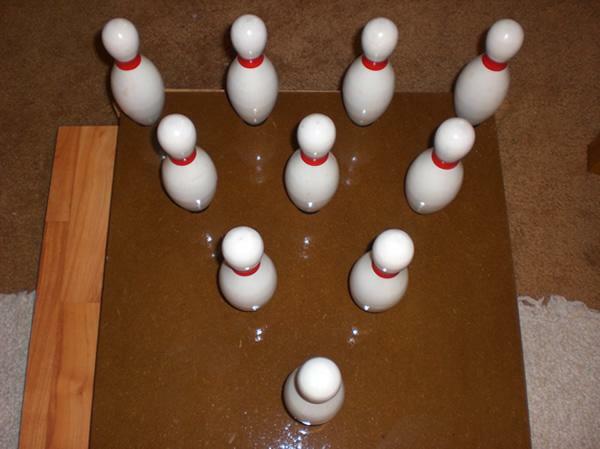 Then I realized that the pins and balls have to be scaled to match whatever scale you are using or it will not work. 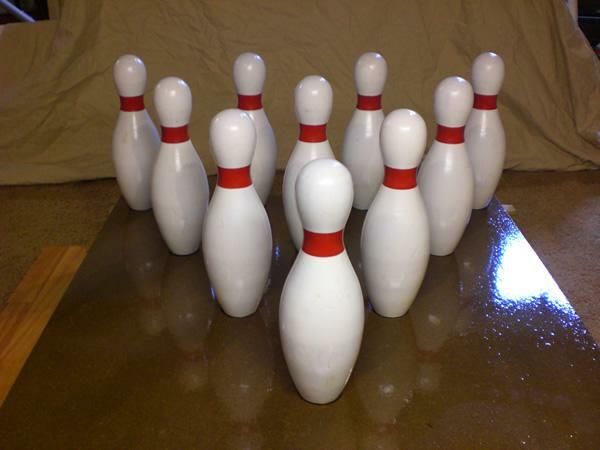 I decided to use half-scale dimensions for the lane and looked for exact half-scale pins and ball. I ran across an antique set of pins on Ebay in perfect shape, they were solid maple pins with 2 hand-turned solid wood balls. They were slightly less than half-scale so I started to make all of my dimensions off of that. The calculations weren’t nearly as easy as just dividing everything in half. Here is the original/concept pindeck and pins. 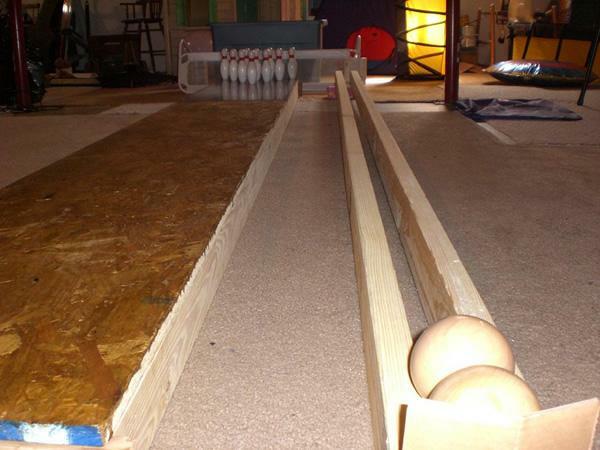 To match the scale of the ball and pins the lane is only about 18 3/4 inches wide. The pindeck is 3/4″ MDF with about 5 coats of polyurethane on it. Below is the original game we played. 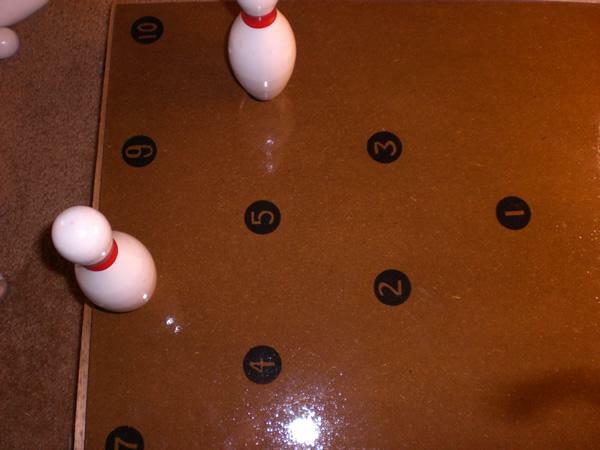 We used the 4 foot pindeck, attached to an 8 foot piece of 3/4″ OSB flooring with a couple coats of polyurethane on it. I even made a makeshift ball return. My daughters and I had a lot of fun playing. This entry was posted on Tuesday, July 1st, 2008 at 9:25 am and is filed under Updates. You can follow any responses to this entry through the RSS 2.0 feed. You can leave a response, or trackback from your own site.